1-2 Week Backordered : This item is out-of-stock, but is typically re-stocked within one week. You will not be charged for your backorder until it ships. There are never any additional shipping charges for backorders (Excludes Overweight Items). If a backorder takes longer than 30 days to ship, BCP will notify you before shipping or charging. Mellow, smooth, and sweet, Baccarat The Game remains an everyday favorite and best-seller. A throwback to premium cigars of the early 20th century, Baccarat is made using a mellow blend of Honduran tobaccos and finished with a sweetened cap for an effortlessly enjoyable smoke with generous, satisfying flavor. Baccarat is easily one of the best values in our humidor, offering consistent burn and taste at a very reasonable price. 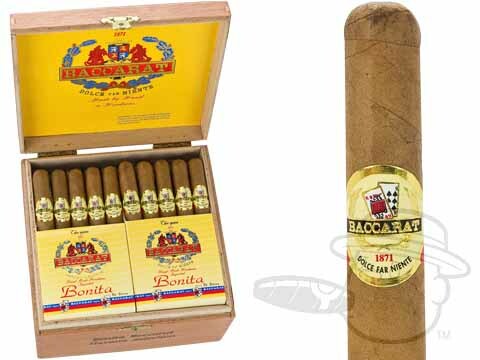 Baccarat Bonitas carry sweet, creamy, and woody flavor with a mellow body in a 4 1/2 x 30 small cigar. Very nice mild cigar. Great size for smoke through out the day. I get these for my Dad, his favorites used to be the connies but since they have been discontinued, these have been a great replacement! he really enjoys them and says they are mild and perfect. I usually buy Baccarat Platinum, a medium cigar that is better than most. Sometimes they are out of stock and they send them in two batches, but I never have to wait long and occasionally, when they don't have them in, they have sent extra complementary cigars as a " thank you " for waiting. All in all, I keep coming back to BestCigarPrices because they do have the best prices and they do take care of customers. Fantastic cigars. My absolute favorite. Highly recommend. Amazing cigars. My absolute favorite. They are all I buy. Baccarat Bonitas is rated 4.9 out of 5 based on 5 customer ratings.